Ultherapy® uses ultrasound to lift and tighten the skin on your face and chest, without surgery. 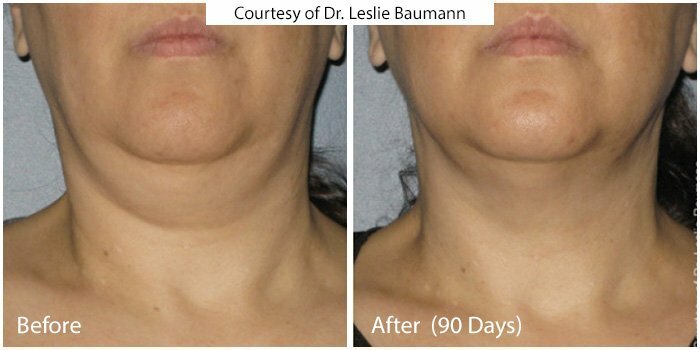 Ultherapy® is the only non-invasive procedure FDA-approved to lift skin on the neck, under the chin, and the eyebrow, and to improve the appearance of lines and wrinkles on the décolletage. 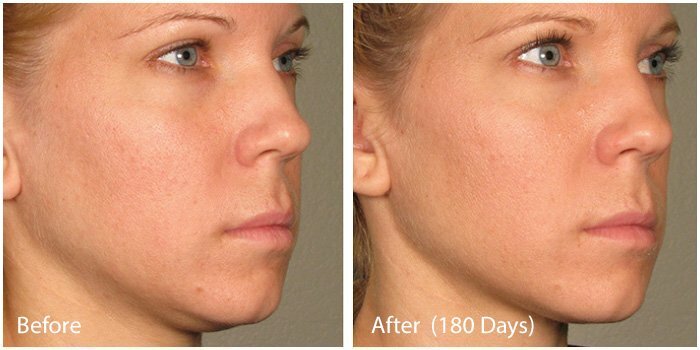 Ultherapy® works by stimulating collagen over time. Due to aging and environmental factors (i.e. smoking and sun exposure), collagen production in the body slows down. Over 2-3 months following your treatment, new collagen is produced, lifting and tightening the skin. Ultherapy® is the only non-invasive treatment cleared by the FDA to actually lift skin. Ultherapy® is also the only cosmetic procedure to use ultrasound imaging, which allows practitioners to see the layers of tissue targeted during the treatment to ensure the energy is deposited to where it will be most beneficial. With the addition of the new Ultherapy® Décolletage Treatment, Ultherapy® is also now the only non-invasive procedure specifically indicated by the FDA to improve lines and wrinkles on the chest. 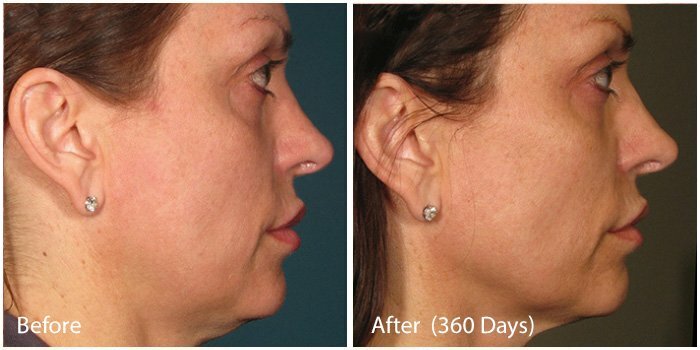 Ultherapy® uses sound energy, tried-and-true ultrasound, which has unique properties that allow it to bypass the surface of the skin to treat depths not matched by any other non-invasive cosmetic device. 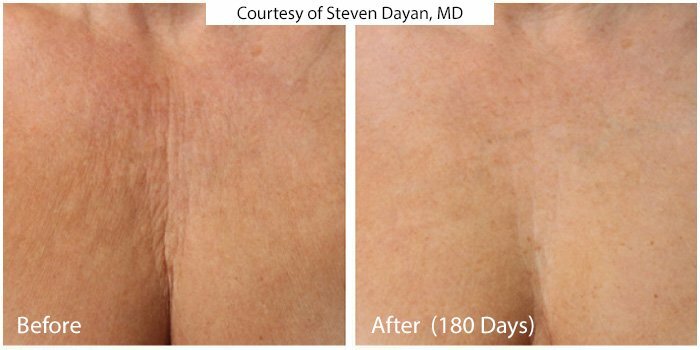 Ultherapy® ultrasound stimulates collagen production in the skin’s foundation, resulting in a clinically significant lift of tissue over 2-3 months. Lasers rely on light energy, which cannot reach deeper skin layers at an optimal temperature, so laser treatments typically only treat superficial skin and are not FDA-cleared to lift skin. Since the two technologies often treat different types of skin issues, they’re actually very compatible. How does Ultherapy® stimulate the creation of collagen? Ultherapy® deposits focused ultrasound energy deep beneath the skin at the optimal temperature for collagen regeneration. The treatment jumpstarts a natural process, known as neocollagenesis, to produce fresh, new collagen. Ultherapy® doesn’t involve any creams, fillers or toxins; it just relies on your body’s own collagen-building process for natural, noticeable results.